Emerson junior Erin Goodyear leads the Generation Citizen class at Melrose High, which is tackling the problem of The Knoll, aided by Bob Driscoll of the Melrose Veterans Advisory Board. ELROSE — Just a little after 2 p.m., at the area known locally as The Knoll across from Melrose High School, the daily bedlam ensues. Cars speeding, swerving, cutting each other off, double-parking or blocking passage; pedestrians in peril; gridlock; honking horns and hand gestures; the long, strained wait for a break in the constant stream of cars trying to turn onto Lynn Fells Parkway. This is just one of thousands of parking lots at thousands of high schools across the country. Generation Citizen has helped students organize against bullying at Malden High School and try to amend the no backpack policy at Medford High School. But that’s precisely the point. The nonprofit Generation Citizen strives to prompt the youngest generation into civic service by getting them involved and interested in issues that personally affect them and their communities. Each semester, the Boston-based organization — founded in 2008 and also operating out of New York, Providence, and San Francisco — sends its cadre of volunteers to teach dedicated classes, which are offered as electives. The volunteers, called democracy coaches, are students from local college chapters of Generation Citizen. This semester, they’re working in 17 local schools, including Melrose, Roxbury, and Jamaica Plain, according to Gillian Pressman, Greater Boston site director. Previously, classes have been held in Medford, Malden, and Lynn. Projects have included curbing teen smoking; expanding access to career education; hosting mock elections to increase voter awareness; and even tackling gang violence. The process serves a dual purpose: College students who serve as coaches get classroom experience and the opportunity to hone their leadership, critical thinking, and public speaking skills. “You’re learning the advocacy process and teaching it to students,” said Billy Rutherford, a member of the Generation Citizen chapter at Tufts University, where he’s majoring in history and Africana studies. 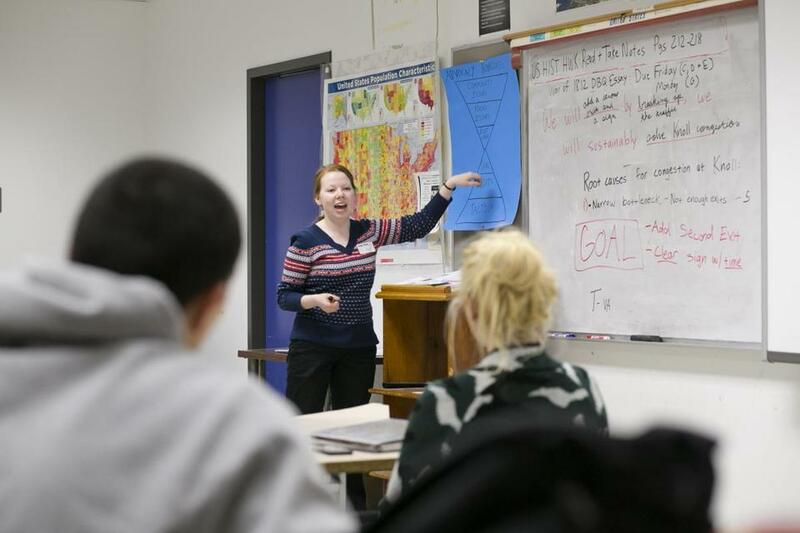 The Melrose class, taught by democracy coach Erin Goodyear of Emerson College, started at the end of January, and students will be participating in the Greater Boston Civics Day at the State House on May 5. When each new class begins, students brainstorm a topic personal to them. As Noone explained, some ideas included fixing local roads, examining health care in the community, and improving school lunches. The Knoll — named as such because of the large outcropping of land at its center — is a one-way, circular parking area for both students and the public (who use the adjacent dog park and athletic fields). There’s only one entrance and exit, and it’s wedged between two stoplights off the Lynn Fells Parkway. It’s such a source of frustration that students get vitriolic when discussing it. “Parking at the Knoll is a nightmare,” student Elisa Lemack wrote in the school’s publication, The Imprint, in January. She noted the “daily traffic jam”; overall dangerous driving by her fellow students, littering, idling middle school parents blocking passage as they wait for their kids, and locals double-parking as they use the adjacent dog park. A recent early-morning class — about a dozen students in hoodies, headphones, and backwards baseball caps, a few filtering in with late slips — considered the options. Some suggestions: Post signs to close entry at the heaviest traffic times in the morning and afternoon; change the timing of the nearby traffic lights; add a dedicated traffic light; create a separate entrance and separate exit; install trash barrels to cut back on littering. If he and his fellow students choose that option or another, the next step, Noone said, is to figure out how to put it into action: Who in city government are they going to speak with? What will be their strategy in doing so? “What specifically are we going to tackle to improve it?” Noone asked.